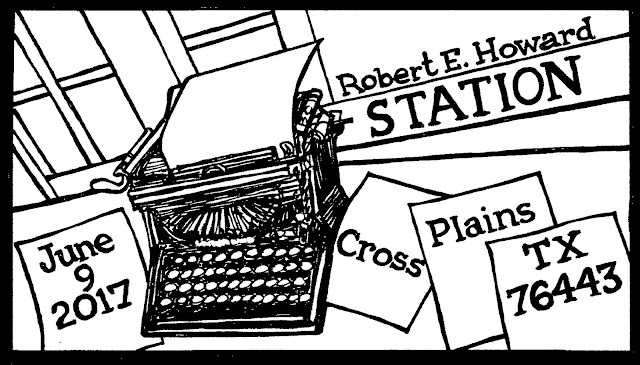 With Robert E. Howard Days in Cross Plains less than three weeks away now, we'd like to share some reminders for all attendees making the trek to West Texas. Some folks like to show up early, so let it be known that Thursday is the new Friday, just as Wednesday is the new Thursday. Really, it's not as confusing as it sounds. The Alla Ray Morris Pavilion adjacent to the Howard Museum will be "open" to everyone starting on Wednesday afternoon. It's a good place to meet up with friends and just hang out while waiting for the festivities to begin. You will no doubt see folks from Project Pride getting everything ready, so if you'd like to volunteer a little time to help them any way you can, they would certainly thank you kindly. On Thursday late afternoon in Cross Plains you can show your support for the Barbarian Festival by attending the Fish Fry at the Senior Center right downtown and then watch the four-hour parade to celebrate the Festival on Saturday at Treadway Park. Only kidding about that four hour thing. The Howard House and Museum will be open on Thursday afternoon from 2 to 4. You will be able to tour the house and get in early to the Gift Shop, but there will be no docents available to give you a tour. Speaking of the Gift Shop, please note that they do not take credit or debit cards, so it's cash or check only. Same is true at the Silent Auction held at the Banquet on Friday night. There are several ATMs located around town for your convenience. And speaking of the Celebration Banquet, there are still seats available but they are going fast. For $15.00 (per person) you get to sit down to a delicious Texas style dinner with 124 of your new and old friends, have access to the Silent Auction and hear 2017 Guest of Honor Paul Herman. This is the ONLY FEE for the entire weekend, as all other activities are free! You can still mail your reservation to Project Pride, POB 534, Cross Plains, TX 76443 or Paypal your dough to ProjPride@yahoo.com. And speaking of the Silent Auction, we are still looking for donations of Howard items to fill the tables. 100% of the money from the Silent Auction goes to the maintenance and upkeep of the Robert E. Howard Museum, so please help them out! You can send your tax deductible donations to the above address or bring them to the House on Friday before 4 pm. Thanks! Don't forget the special Postal Cancellation stamp souvenir (shown above) is only available at the Cross Plains Post Office on Friday. ALL PANELS this year will be held at the First United Methodist Church on the north side of town. We're looking forward to this new venue with more room and better acoustics and presentation facilities. Please plan your attendance time accordingly, as it may take you a whole extra minute to travel to this site. 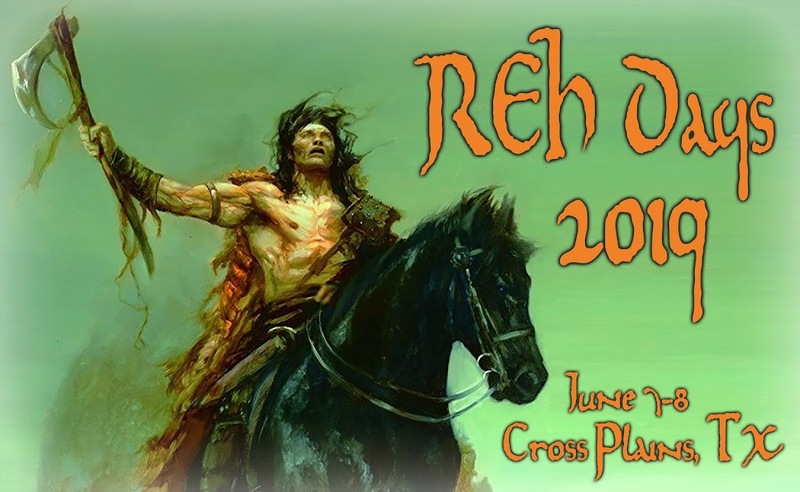 The Robert E. Howard Foundation will have a tent set up in the back yard of the House where you may purchase all the REH titles available from the REH Foundation Press. And finally, Cross Plains is wet again and we're not talking about the recent storms. You may now purchase beer and wine within Cross Plains city limits, for consumption on private property, eliminating the trip to Brownwood to the drive-thru liquor store (unless you really want to!) As always, please practice discretion. Thanks. Ok, stay tuned to this page for additional updates or stuff we've forgotten to tell you. There's always plenty of room at Howard Days for you, so even if it's a last minute decision, y'all come! Cross Plains No Longer Dry!